In what one observer is calling “a watershed decision,” the Ninth Circuit Court of Appeals on May 11 granted a petition briefed and argued by BC Law students Jovalin Dedaj ’16 and Cristina Manzano ’16 (pictured). They represented Guillermo Vera-Valdevinos, a lawful permanent resident and citizen of Mexico, who sought a review of the Board of Immigration Appeals’ decision finding him ineligible to apply for cancellation of removal based on a drug conviction. In 2015, the Ninth Circuit appointed the Boston College Law School Ninth Circuit Appellate Program, which was founded and is supervised by Assistant Professor Kari Hong, to represent Vera-Valdevinos. Dedaj and Manzano researched and briefed a novel legal theory to the Court this past April, impressing the judges who complimented them from the bench. The students’ client is a lawful permanent resident who has been in the United States for over 30 years. He is 47 years old, married to a US citizen wife, and has two citizen children who are in college. In 2013, he was convicted of one count of possession of a narcotic with intent to sell or distribute. After determining that the state offense was not serious, the state court judge granted probation in lieu of imposing a prison term. Under immigration law, the nature of the offense was considered the worst of the worst, an aggravated felony and a deportability ground. Vera-Valdevinos was ordered removed, detained, and, in 2015, ICE removed him to Mexico from where he attempted to fight his removal pro se. The Ninth Circuit’s unpublished decision is “quite remarkable for its scope,” Hong said. It held that the drug offense in Arizona is indivisible, which means that it can no longer serve as a basis for deporting anyone. The decision prevents Arizona drug crimes from being aggravated felonies and even the basis to start removal proceedings. “One of my central criticisms of the current immigration laws is that they treat hundreds of crimes the same, failing to take into account that state and federal judges who convicted and sentenced non-citizens determined the specific crimes were minor, not serious, misdemeanors, or deserving of probation instead of prison time,” Hong said. Last year, in Lopez-Valencia v. Lynch, 798 F.3d 863 (9th Cir. 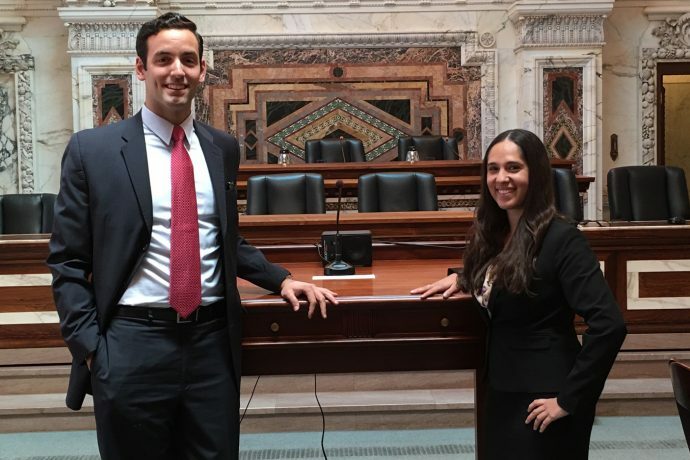 2015), Kelly Schwartz ’15 and Jeremy Sanders ’15 successfully argued that their client, a legal permanent resident who had stolen a $2 can of beer, should not be classified as having committed an “aggravated felony.” The classification prevents someone from remaining in the country and applying for any relief. Lopez-Valencia extended that protection to California theft crimes, ensuring that non-violent California theft crimes could no longer be aggravated felonies. The Ninth Circuit Court of Appeals is unique in providing law students with an opportunity to brief and argue a case during an academic year. It screens the thousands of pro se cases to identify those with important legal issues that would benefit from further development. The Law School has been participating in the program for the past three years. The Boston College Law School Ninth Circuit Appellate Program has prevailed in four of its five cases and has had two published decisions. The students prepare for oral argument with the generous help of Boston practitioners, BC faculty and staff with immigration expertise, and alumni of the clinic who return to help moot the students. “The students could not have succeeded without the time and expertise these people offered,” Hong said. More: see the BC Law: Impact Blog summary, and an Impact post by Jovalin Dedaj ’16 chronicling his experience.